The ENIGMA D3O® is a modern day technical Chainsaw Boot offering extreme comfort combined with class 2 chainsaw protection (24m/s), along with the requirements of EN ISO 20345:07 Safety Boot. The seamless upper construction manufactured from the Italian PERWANGER® Leather offers water-repellency whilst remaining breathable. This premium quality leather is trusted by major footwear brands for its proven performance and durability in the most extreme conditions. Added protection is provided to the lower boot by means of the 360 degree rand providing extra protection to the leather from knocks and scrapes. For all-day comfort the ENIGMA D3O® is lined with a climate-regulating membrane which protects against external moisture and maintains breathability. 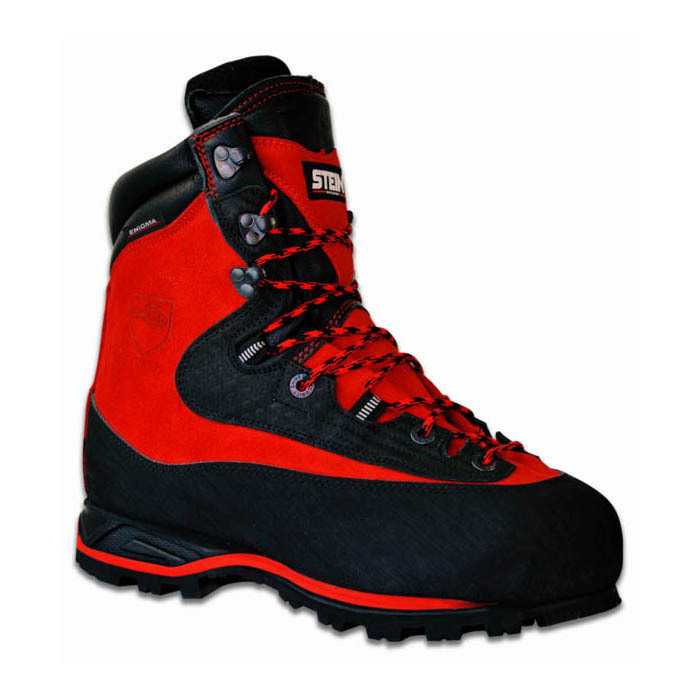 Further increased comfort is provided by the anatomical padding inside the boot along with the padded adjustable tongue. VIBRAM® Carrarmato Lug system combines multi-traction grip with increased braking and the open lug system for self-cleaning. The asymmetrical heel has an undercut design for more secure braking and allows for a natural touch down when walking. To benefit fully from the VIBRAM® technology the ENIGMA is equipped with D3O® Decell technology in the COMFORT in-sole which is designed to absorb negative impact forces, reducing stress to your lower limbs and exploiting the energy used during activity.